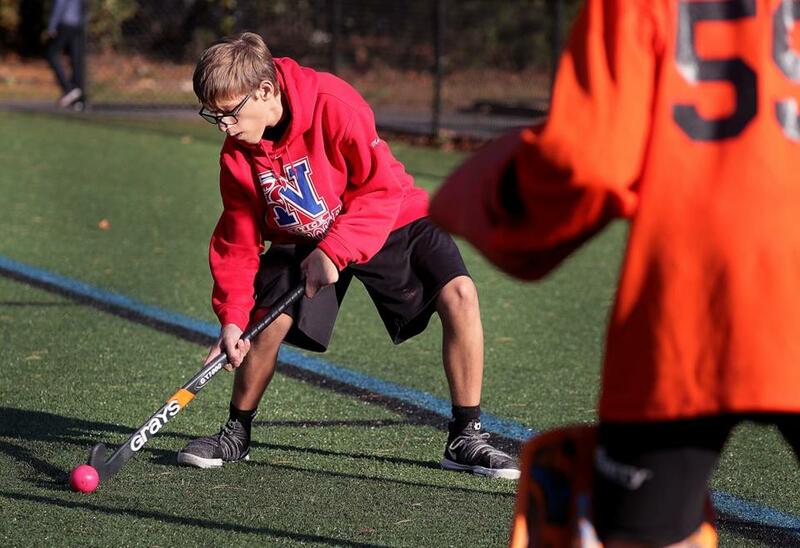 Jason Mazzola, center, helps players on the Natick field hockey team conduct relay drills. Mazzola, who suffers from Fragile X syndrome, a genetic disorder, has bonded with the team. Mazzola gestures playfully toward a Natick player. When Natick High field hockey forward Allie Collins scores a goal, one cheering voice resonates above the rest. Same goes for junior Marie Canty, the team’s third-leading scorer. And when Maddie Clark, a junior who has been the team’s starting goalie for the last three years, lets in a goal, that same voice shouts words of encouragement. That voice belongs to Jason Mazzola, the son of Natick assistant coach Lizzie Mazzola. At 17, Jason suffers from Fragile X syndrome, a genetic disorder that often leads to some level of intellectual disability. Many times, too, it manifests itself in the form of social anxiety. When Lizzie Mazzola began coaching at Natick in 2015, Jason was attending Learning Prep School in Newton. But he loves sports and wanted to watch the field hockey practices at Natick High, so he would come with his mother and do so from afar. In no time, the girls embraced him as a part of the team. And in February, he transferred from Learning Prep to Natick High. While a transition to a new school can be tough for any student, the girls on the field hockey team and those on the lacrosse team, for which Mazzola also serves as an assistant coach, made this one smoother for Jason. 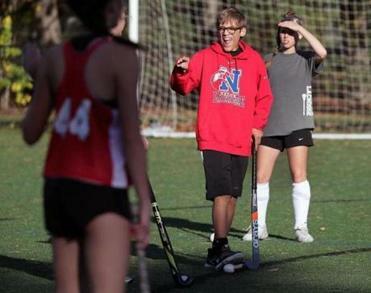 Collins, Natick field hockey’s leading scorer, regards Jason as one of her best friends. She has gone to two proms with him, one at the Learning Prep School and another at Natick. “I think that grew our bond closer,” said Collins of attending their first prom. “That just meant a lot to me, that he cared about me that much, and he was just a gentleman. It grew our friendship even more. Head coach Ann Burnes took over at Natick the same season that Mazzola began. Over three years now, she has watched as her players and Jason interacted and had a profound impact on each other. Take the big football game between Natick and New Bedford on Oct. 27, a game many Natick students attended. Lizzie Mazzola dropped Jason off at the field, where he linked up with Canty and Clark. Afterwards, they all went out to eat with other classmates and later, they drove him home. “He’s always happy,’’ said Canty, “and that just empowers everyone. He’s not afraid to be himself. He loves to go to the football games. He had the time of his life when we went out to eat. As Jason gets older and tackles his senior year in the Natick High Access program, the team has proved to be a major support system in his growth. Some things he’d struggled with, such as making eye contact during conversation, have greatly improved. And the beauty is both his mom and the girls get a front row seat to watch that growth. The change is evident to them with each passing day. It’s a two-way street. Many of the girls on the team can testify to how knowing him has changed them. And seeing him be himself and fit in just like any other high schooler is a major reward in and of itself. “Our entire team really sees him as a friend,” said Collins. “I think it’s important for everyone to have the opportunity to feel welcomed and loved in the community. . . .
Mazzola prepares to take a shot to help warm up a team goalie during practice. Logan Mullen can be reached at logan.mullen@globe.com. Follow him on Twitter @ByLoganMullen.